Kids Math Teacher: Linky party with Collaboration Cuties--Math book review. 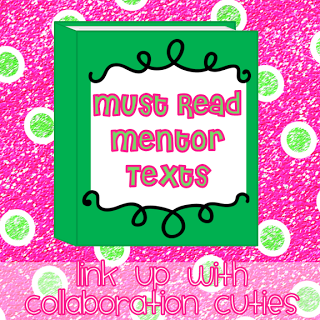 Linky party with Collaboration Cuties--Math book review. I found this cool linky party, and since I am reviewing math books once a month I think it will be a great place to link that up. Doubling/multiplying by two in a fun way: I enjoyed how the McFay brothers were twice as big as the one before. Shows weight: Minnie can barely hold the serving tray once Papa McFay orders. My review: It was well written and had beautifully clever illustrations. I enjoyed how the story flowed and the illustrator did a great job of portraying size and proportion. Look at the pictures and ask questions: How many of the pies are the same on each tray? How big would papa be if he was twice the size of his oldest son?--Would he be able to fit through the door? Make some food and weight it: When making dinner salads or pies, take time to weigh them and calculate how heavy 4 salads or 8 pies actually is! Have you enjoyed this book? How have you taught math with it? Can you think of some activities to do with it?